Everyone at Cynapse is incredibly excited with this feature and we want to take this opportunity to encourage entrepreneurs in the India - with the world’s fastest growing startup scene, to join the app economy. Consumers around the world are embracing smartphones, and by the end of 2014, 1.76 billion people are estimated to own and use smartphones. By 2018, 500 million Indians are going to be mobile internet users and will be contributing to nearly 10% of the global smartphone market share. Alongside smartphone growth, rising incomes will unleash the online spending potential of billions of people. Further, payment systems like Apple Pay are enabling transactions in the real world with a single touch, that were previously un-imaginable with traditional banking. This growth gives talented entrepreneurs, developers and designers an opportunity of a lifetime to participate in the golden age of making apps. One of the biggest advantages of the mobile app business is that its market is not bound by geographical limits. 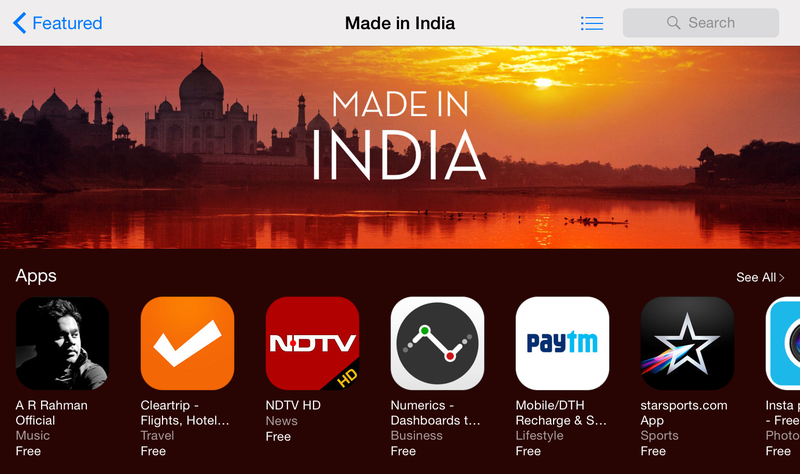 You can be in India and create an app that can be used by consumers anywhere the world. The Apple App Store and the Google Play Store provide a level playing field to publish and sell your apps to a global audience. All you need is a great app that solves a large problem. All apps made by Cynapse are designed and built in India but are sold and highly ranked in over 150 countries on the Apple App Store. The idea being: Make in India, Design for the World. Cynapse has been designing apps for the iOS platform since 2010 and our journey so far has been thrilling. We have over a million customers of our apps and nearly everyday we are humbled by the heartwarming stories our fans and users share about how our apps help them. The international media loves our apps and recommends them regularly to their audiences. The App Store, our primary marketplace, features Localscope, Numerics and Phlo prominently. Localscope has been rewarded the Best app of the year by Apple and our customers worldwide have voted and made us win the Best App Ever Awards multiple times. Our path to success on the App Store has been far from easy, but we have learnt that if a great idea is coupled with good design and implemented with care, the world sits up and takes notice. In 2013, the app economy was worth $68 billion and is projected to grow to a staggering $143 billion by 2016 as smartphone ownership soars worldwide. Apple has been a huge contributor to this economy. With more than 1.2 million iOS apps and over 75 billion downloads, the App Store has created an entirely new industry for iOS app design and development. The firm recently estimated that the app economy will add $86 billion in revenues to worldwide GDP in 2014. Further, Apple says it has contributed to 629,000 jobs across Europe, and over 500,000 of these roles represent the booming app economy. This is a prosperous time for entrepreneurs in India to join the app economy. India has been a leader in providing IT services to the world. By promoting “Make Apps in India”, we can encourage Indian entrepreneurs and technology businesses to climb higher in the value chain by focusing on innovation and drive more jobs and revenues to India by addressing a truly global audience. Sachin Bansal, founder-CEO of Flipkart, in a recent interview, said that making apps in India should be the next step for mobile companies and developers. Lets spread the message and motivate, cheer and back entrepreneurs to solve great problems and Make Awesome Apps in India for the world!